St. Catherines, Ont. 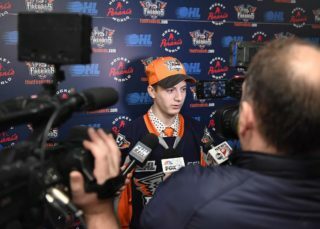 – Despite the Firebirds leading 1-0 after the first period and then trailing by only one goal with 12 minutes left in the contest, Niagara would catch fire late to post a 7-2 victory over Flint in front of a sold out crowd of 5,300 fans at the Meridian Centre Saturday night. 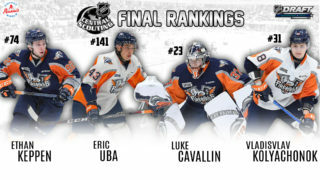 Ethan Keppen increased his point streak to eight games, Ty Dellandrea (Dallas Stars) found the back of the net and Luke Cavallin made 42 saves in the game. The IceDogs were led by Akil Thomas’ (Los Angeles Kings) five-point night (2G, 3A) and a hat trick by Jack Studnicka (Boston Bruins). Dellandrea produced the lone goal of the opening frame at 17:21. His aggressive forecheck resulted in a turnover at the top of the right offensive circle. He settled the puck in the high slot and sniped a wrister past netminder Stephen Dillon, blocker-side. The goal was Dellandrea’s 16th of the season, unassisted. First-period shots were 12 – 10 in favor of the IceDogs. The second period was a brilliant display of goaltending at both of ends of the ice until Niagara found the back of the net on a third attempt from point-blank range. Jack Studnicka scored his first of the night and 15th of the season at 11:46. The initial shot came from Matt Brassard (Vancouver Canucks) at the right point. The rebound was directed on goal by Philip Tomasino, and the second rebound found Studnicka at the bottom of left circle with enough space to get the job done. At 13:23, Studnicka scored his second of the night on the power-play, this time capitalizing on a deflection off a skate in front of Cavallin. Assists went to Akil Thomas and Brassard. Niagara held the second-period advantage in shots 22 – 11. In the third, the scoring blew wide open. At 8:22, Thomas scored his first of two in the period assisted by Jason Robertson (Dallas Stars). Robertson scored his 32nd of the season at 10:29, assisted by Kyen Sopa and Thomas. Thomas scored his second of the contest and 21st of the campaign at 12:22, assisted by Bradey Johnson and Jake Uberti. At 14:23, Studnicka completed his hat trick with the man-advantage. Ben Jones (Vegas Golden Knights) and Robertson picked up the helpers. Flint would light the lamp one more time at 15:37. Jack Wismer won an offensive zone draw that got things rolling. Dennis Busby passed the puck along the right wall to Cody Morgan in the circle. Morgan made a tape-to-tape pass across the slot, where Ethan Keppen was crashing the net. With a defender draped all over him, Keppen still managed to convert on the back-door play for his 15th of season. Uberti finished off the scoring for Niagara with his second of the season at 17:44, assisted by Thomas. Final shots were 49 – 34 in Niagara’s favor. The Firebirds were unable to solve Dhillon and the Icedogs’ penalty-kill on three opportunities. The IceDogs converted on two of three chances with the extra man. In the face-off circle, Flint won 32 of 70 draws. Flint is back in action tomorrow afternoon against the Oshawa Generals. Puck drop is set for 6:05 p.m. (ET) at the Tribute Communities Centre in Oshawa. 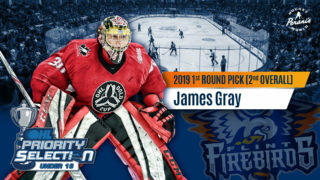 The game can be heard live on the radio throughout Flint & Mid-Michigan on US 103.1 FM, online at www.us103.com or by downloading the US 103 app here. Pregame coverage will begin 35 minutes prior to puck drop at 5:30 p.m. The game will also be televised live in Oshawa on channel 10 / 510 (HD) for Rogers TV cable subscribers, in addition to being televised live province-wide across Ontario on channel 436 for Rogers TV cable subscribers and channel 477 for Cogeco TV cable subscribers.